Minnesota’s Amy Klobuchar addressed supporters Sunday, where she announced she would seek the Democratic nomination for president. MINNEAPOLIS — Senator Amy Klobuchar of Minnesota on Sunday joined the growing group of Democrats jostling to be president and positioned herself as the most prominent Midwestern candidate in the field, as her party tries to win back voters in a region that helped put Donald Trump in the White House. 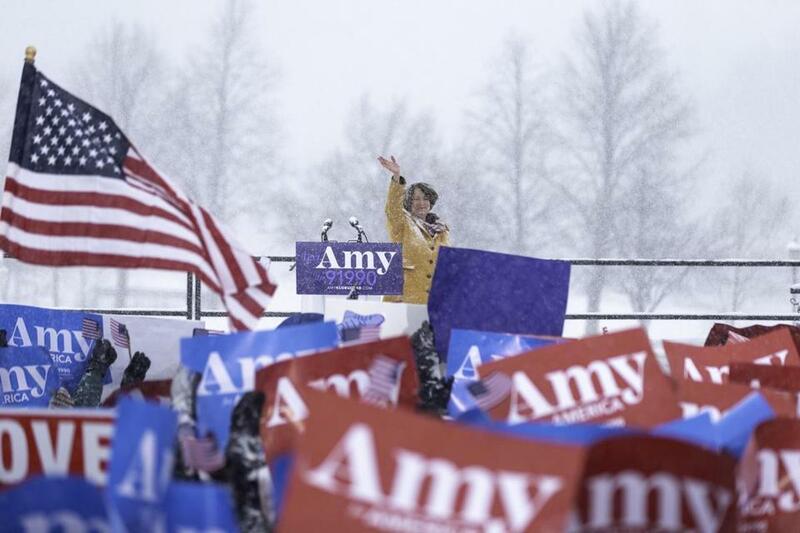 ‘‘For every American, I'm running for you,’’ she told an exuberant crowd gathered on a freezing, snowy afternoon at a park along the Mississippi River with the Minneapolis skyline in the background. ‘‘And I promise you this: As your president, I will look you in the eye. I will tell you what I think. I will focus on getting things done. That’s what I've done my whole life. And no matter what, I'll lead from the heart,’’ the three-term senator said. The list of Democrats already in the race features several better-known senators with the ability to raise huge amounts of money — Elizabeth Warren of Massachusetts, Kamala Harris of California, Cory Booker of New Jersey, and Kirsten Gillibrand of New York. The field soon could expand to include prominent Democrats such as former Vice President Joe Biden and Senator Bernie Sanders of Vermont. The backdrop for her rally was the Interstate 35 bridge over the Mississippi. The span was built after the previous bridge collapsed in 2007, killing 13 people. Klobuchar had worked with then Senator Norm Coleman, a Republican, to help fund the new bridge and get it completed at a faster-than-usual pace. ‘‘We worked across the aisle to get the federal funding and we rebuilt that I-35W bridge — in just over a year. That’s community. That’s a shared story. That’s ordinary people doing extraordinary things,’’ she said. Klobuchar’s focus in recent months has included prescription drug prices, a new farm bill and election security. She supports the ‘‘Green New Deal,’’ a Democratic plan proposed this past week to combat climate change and create thousands of jobs in renewable energy. Among the other Midwestern lawmakers who could also seek the nomination are Senator Sherrod Brown of Ohio, who has been visiting early voting states, and Pete Buttigieg, the mayor of South Bend, Ind., who established an exploratory committee last month.